I was contacted a couple months ago and asked if I'd like to receive a complimentary copy of a new dessert cookbook called Sugar, Sugar: Every Recipe Has A Story by Kimberly Reiner and Jenna Sanz-Agero. Well I love sugar so I said yes! I was excited to get my hands on this book because it reminded me of a modern version of my favorite community cookbook. The book is broken up into 7 chapters- the first telling you about the book and the "sugar momma" authors and how the book came about, and then came the recipes categorized by type of dessert- Cakes, Tarts and Pies, Cookies, Bars, Confections and Recipe Legacies. You see, each recipe is contributed by someone else, much like a community cookbook. Because the recipes are submitted by other people, they are not all from scratch, some of them contain shortcut ingredients, such as boxed cake mix and canned pie filling. But this book is more than just a collection of recipes because each entry also has a short story accompanying it. The stories were funny, sweet and sentimental. Some were about the celebrations in which they were served, some were about the people and hands that made them. The one constant is that this books bring life to the recipes. Another thing I liked about this book was that the authors leave you "Sugar Momma Tips" about the recipes, like how to turn these bars back into a pie, or how to how to make the recipe your own by swapping out ingredients. They also give you tips on how to speed up the recipe if you're pressed for time. 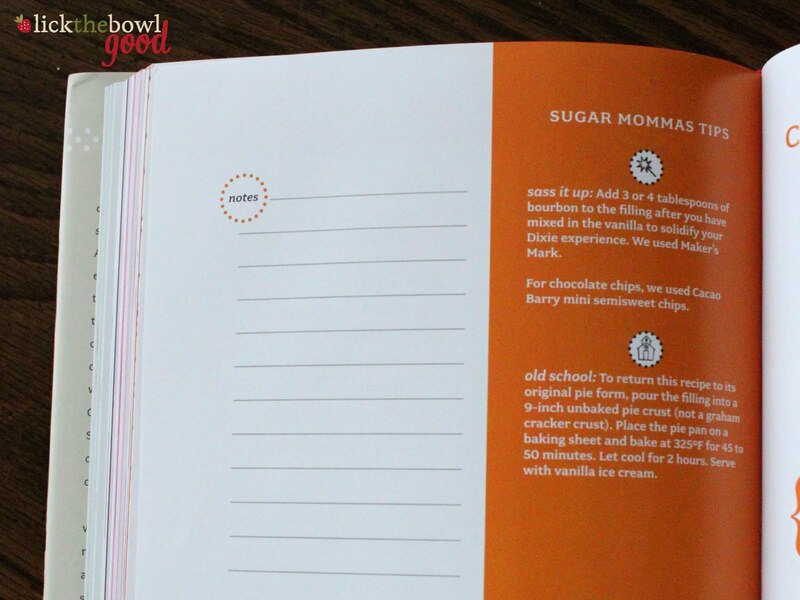 On top of all that, there is a section for note taking, so you can jot down comments or changes you made to the recipe, much like grandma would have done in her own handwriting on a recipe card. When it came down to deciding what to make for this review, I decided on a caramel cake. As you can see, that is not what I have here. I found the cake to be cloyingly sweet and just couldn't eat it. I tried to pass it off onto others and they all said the same thing. It had great buttery caramel flavor, just way too much sugar. But then again, it comes from a book where the word "sugar" appears twice in the title. I turned to these Kentucky Pie Bars, because we love Derby Pie and I liked that these could be made in bar form with a graham cracker crust. These were just like the pie I make and not too sweet. They were like a cross between a magic cookie bar and Derby Pie. 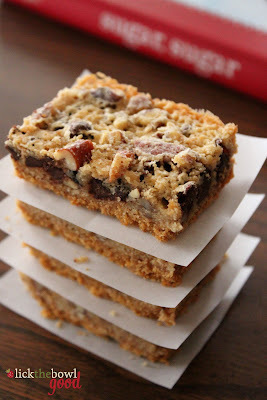 I would definitely make these bars again, but I would add more Bourbon to the filling (I added the lesser amount) and add a bit more butter to the crust to help bind it together since I found them to be a little crumbly. I also have my mind set on making the cover recipe as well as a pie and another bar cookie recipe, so stay tuned. Preheat the oven to 325 degrees F. Butter a 9x13-inch baking dish (or use non-stick cooking spray). To make the crust: Place the graham crackers and the melted butter in a medium bowl and mix together until the crumbs are thoroughly moistened. Press mixture firmly and evenly on the bottom of the baking dish and set aside. To make the filling: Place the sugar and butter in a large bowl. With an electric mixer, beat mixture on medium speed until well combined. Reduce the mixer speed to low and the eggs ones at a time, add the vanilla and Bourbon, if using. Gradually add the flour until just combined. Use a wooden spoon or spatula to fold in the pecans and chocolate chips. Pour the filling on top of the crust and spread it evenly. Bake for 33-38 minutes, until the bars begin to turn a light golden brown. Remove from the oven and let them cool before cutting. Or eat them while still warm and gooey. Now for the giveaway. The publishers and I want you to have your very own copy of Sugar, Sugar: Every Recipe Has A Story. To enter, all you have to do is leave a comment on this post. For a second entry and in the spirit of this book, leave a seperate comment telling me a brief story about one of your favorite recipes. That's it! I'll pick a winner in a couple days and the folks at Andrews McNeel Publishing will send a book straight out to that individual. Good luck and happy story telling! THis sounds like the best kind of cookbook. I would love to have a copy. ooh, I'd love to win! I love how there's a section for notes, very smart! oh heck yes - this sounds like a fun recipe!! The best recipe ever is my Grandma's noodle recipe. It's simple but turns out great every time. The story - she has taught 3 children (1 boy), 6 granddaughters, and 1 great granddaughter how to make those noodles that are a part of our holiday celebrations. hmm. a story about a recipe? i've named my sangria recipe after a friend who has spent a TON of time in spain, and still thinks that my sangria is one of the best she's ever tasted. that compliment definitely won her a recipe-naming-favor! I have so many stories about so many foods. I think one of my favorite ones is the night that my BFF and I got tipsy on a combination of champagne, peach schnapps, and orage sherbet all blended together. We called our concoction the "peach sunrise surprise," and we drink them now nearly every time we get together for a girl's night. Yumm! This cookbook is right up my alley!! Thanks for the giveaway!! Merry Christmas and a Happy New Year to you and yours! This book looks like one my daughter would love! Ohhh! This giveaway looks delicious - the book sounds awesome :) ~ Andi T.
Well, I'm kind of a newlywed - so I don't have a favorite recipe yet. But, one of my husband's favorites are my bacon chocolate chip cookies :) ~ Andi T.
My favorite recipe is one that I love because it is so simple and very quick to make. Hot Milk Sponge Cake with a citrus syrup. This cake takes minutes to prep and is very light, airy, and delicious. I found it in a great cookbook "Desserts That Have Killed Better Men than Me"
This sounds great! I love the section for note taking. These bars look delicious! My favorite recipe of all time was my grandma's coconut cream pie. Since she died, I've never found anyone who makes it as good as she does. My oh my how I miss that pie! I have 4 favorite secret recipes. One is my roll recipe, my whole wheat pizza, my hummus and my salsa. If I told you what the ingredients are, I'd have to kill ya! Sorry.... But I do love to try out new recipes > especially if they have sugar in them. So, pick me, pick me! for the give-a-way. I live in rural Alaska and we power with solar and wind on our homestead. I have a wood burning stove that I love to cook on. We fill our freezer with meat that we hunt right here on the property, fill the root cellar with vegs. from the garden, gather fresh eggs from the chickens and milk from our goats. I'm a grandma and we have 2 or our 3 grown children and their families living on place. This sounds like a very fun book. The notes section is a brillient idea, too. Sounds like a great book, I would love to win! One of my favorite recipes is this maple oatmeal muffin that've I've made for Christmas the past twoish(?) years. They always disapear within minutes. And it's one of the very very few things my sister will actually eat more than one of. A friend gave me a recipe for Tater Delights that make delicious cookies. The recipe calls for sweet potatoes, raisins and pecans. I was running out of time to make these so instead of cooking the sweet potatoes and then mashing them smooth I bought baby jars of sweet potatoes. When my friend tried one of my tater delights she wanted to know how did I get them to taste better! The baby food sweet potato makes the cookies very smooth and really good. I have made them this way for over 10 years. I love making sugar cookies. My mom and I always make about a bazillon of them together at Christmas time. Sugar Sugar = YUM YUM! Thanks for the chance to win. It looks like a great book. THe story that I have about recipes is that I normally bake treats and give them away so I don't eat it all. Some of the custodians at work, now request baking when we go to thank them for their hard work. Now that's a compliment. Oooh. I like Sugar. Sign me up! a book so nice they named it twice ;) the bars look great!! Sounds like a great dessert Cook Book, I would love to aadd it to my kitchen! One of my favorite recipe memories is the very first time my daughter and I made Sugar Cooies together. She was 3 yrs. old....we still make them together even a 12 yr. old oves traditions! 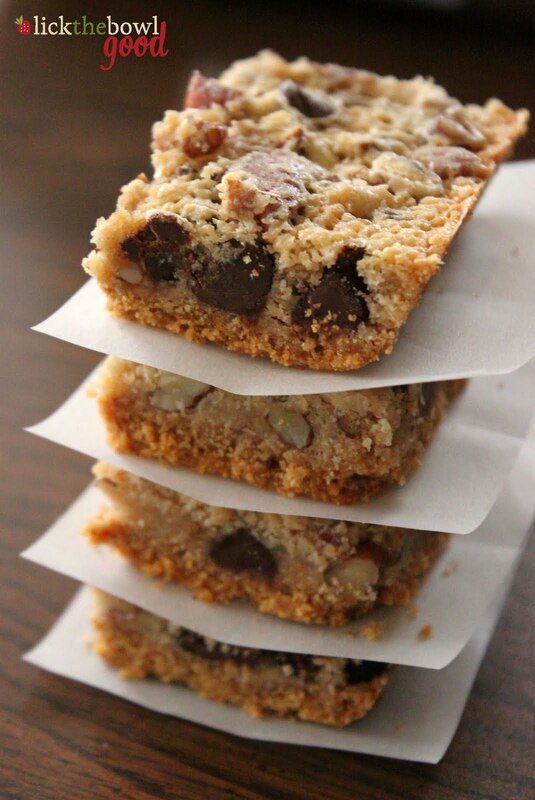 These bars look divine. Thanks for the recipe and the giveaway! looks like a great book. Hope you have a wonderful 1st Christmas with your little one. My favorite holiday recipe is my Dad's fudge. He makes it every year, sometimes it is a success and sometimes we have hot fudge sauce instead of fudge. It is always yummy no matter how it turns out. I think I need to review this cookbook so I can send it to a friend who lives all things sweet. Sign me up! My favorite recipe is my mom's apple pie. Its so simple but always delicious. She taught me to bake with love and not to worry about mistakes. Thanks for the giveaway! I have lots of recipes with stories attached but the one that comes to mind first is my grandma's chocolate cake with caramel icing. If my mom wanted this cake for a weekend she would make it in the middle of the week because it got better, a bit more moist, after a day or two earning it the nickname of "Wednesday cake". My son just asked for the recipe so he and his wife can make it for Christmas. I love to make and give soda cracker cookies. There are only 5 ingredients and they are quick. Thanks again. My love for cookbooks started in college with a roommate who browsed them as a distraction from studying! Then we would go bake! Love your recipes! I seem to be saving and trying them all! Love the choc chip cookies, bundt cakes, caramel cake, what next!? This sounds like a WONDERFUL cookbook. Thanks for the chance to win. I LOVE my mom's Sandies recipe. I've heard them called Mexican Wedding Cookies, but they are definitely one of my favorites and I'm going to start making them every Christmas as a new tradition. 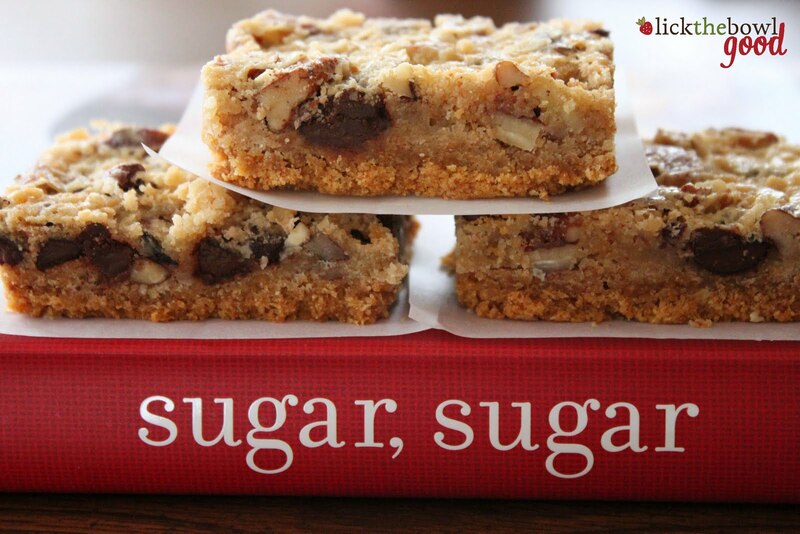 The book does sound amazing and so do the pecan bars ! I would love this. Hayden is getting bigger and more handsome in each picture. One of my favorite recipes is my mom's stuffing. She died of cancer 10 years ago and I miss her so much. It's just bread cubes, saltines, tons of butter, celery, onions, chicken broth, eggs and spices. My daughter loves it and it brings back wonderful memories eevry time I make it. This sounds like my kind of book. I enjoy reading your recipes and especially learning about your little boy. He is so cute. Thanks for the contest. With Type II Diabetes, I'll pass on the book (makes my pancreas quiver at the thought). Too bad the caramel cake didn't turn out as you'd hoped. I love caramel cake and am looking for a good recipe. But, it looks like you recovered well. Did you say Sugar ? Why, that has my very name in it !! Happy Holidays ya all ! Sounds like an awesome cookbook and I'd love to win it. I really enjoy your site. What a great name for a cookbook! Since I'm a diabetic, I think a cookbook named "Sugar, Sugar", should belong to me, don't you...lol. One time, when I was a Girl Scout back in the stone-wheel days, it was my week to bring the cookies for the cookies. Well, it must have been the day before payday, because there was not butter, margarine, or oil to make the cookies. There was, however, bacon grease. My mother forced me, forced I say, to use that bacon grease to make my oatmeal cookies. I was so angry, embarrassed (and humiliated) by bringing those darn cookies to Girl Scouts. Wouldn't you know it...everyone love, love, loved those bacon grease cookies! I guess that means my mom, rest her soul, was ahead of her time! Who knew? I could be rich now, instead of beautiful...Thanks, mom. Those bars look delish!!! They are a must try for me. I also like the cover of the book. It's fun! I hope you and the family are doing well! Looks like a really nice cookbook! I'm trying not to buy many at the moment..because one leads to another..but this looks worth a look for sure! As for those bars, my gosh, they would disappear fast if they were in my house! My favorite recipe is my Nana's cookies simply called Nana's cookies. Now they do have a name but for some reason we can never remember it. We know it is Italian! My Nana came here from Italy when she was a young woman and already was married and had two kids (she ended up with 7 all together). Nana would make many types of cookies for the holidays and then put them in shirt boxes with tissue paper and each family received a box. Looking back I think it was the greatest gift we received because it came from her hands and her heart. My Nana lived to be 89 and I was fortunate enough to inherit most of her cookies recipes. The first Christmas after she passed I baked some of her cookies and I remember crying when I took my first bite of Nana's cookie and I thanked her for leaving such a great legacy behind. I am blessed to have had her for so many years and to now be able to pass this tradition to my daughter. Baking IS love. One of my faces is nut tarts. I make them every year!!! I love reading your blog!! !The recipes are wonderful and the photos are great!! !Thank you, for sharing your family stories. Though, we've never met in person I feel as though you're a neighbor. Someone, I can share a pleasant conversation with, a deliciously baked recipe and a cup of tea or coffee. It's a magical blog. Happy Holidays to Your Family and a Blessed 2012!!! Sounds like a great book! I love cookbooks, especially ones that feature yummy things to bakes. And how clever to include a space to write note-love that! We have a recipe in my family that has been passed down from a friend of my mom's to each of us girls and it's for a chocolate cake that is absolutely delicious! We just call it the Judy Mix cake, after the woman who passed us the recipe. A favorite recipe story is my birthday BUTTER POUND CAKE story. My mother's family tradition was to bake a butter pound cake for each of our birthdays. One morning around 3:00AM or 4:00AM my mother heard me crying. She came to the bedroom I share with my sister, turned on the light and asked why I was crying? I sat up in bed and told her everyone had forgotten my birthday the previous day. I waited and waited and nothing happened. The day ended and everyone went to bed. My heart was broken. I believe I was approximately 9 or 10 yrs of age. What did my wonderful mother do? She turned on all the lights in the house, went to each bedroom and woke up everyone. It was 5 of us children. my mother went to the kitchen and baked her traditional butter pound cake. She placed butter, sugar, flour, vanilla and a touch of yeast/baking powder in a bowl and stirred. We were allowed to sample the mixture before baking and lick the spoon and even the bowl. Where have I heard these words before? LOL This was approx. 50 yrs ago. When the cake was baked. We stood around the kitchen table and my family sung happy birthday to me. I think we were too sleepy to eat the cake and left it for desert the following evening. I want to make that cake you thought was too sweet! This book sounds amazing. I LOVE cookbooks! I would love to win this cookbook. Some women love shoes, I love cookbooks! I especially like that there is a spot to write notes. My cookbooks are filled with handwritten notes. I hope I win. Thanks for sharing this book and review. Great giveaway! I love collecting cookbooks and trying new recipes. Have a merry Christmas. This sounds like the perfect cookbook! Thanks for the giveaway opportunity. I have created a tradition of making a different dessert every time someone in our office has a birthday. So this would come in very handy. One of my favorite recipe is a Portuguese cookie, called a horse shoe in English. Take some work but the end is worth it. My mom makes it every year. I love the stories with the recipes. It inspires you to create your own story, to take the time to include the family in the process or to remember some of your own stories connected to other recipes. while i think i would agree that cake was too sweet, i think you version looks yummy. the few memories i have of my dear grandmother are food related - her rum balls and homemade chocolates at christmas, eating spearmint leaf jellies (the real ones not the "fake" ones found now) and her sitting on the beach w/ beer and munching on some chips or chex mix. miss you grammy. I love the idea behind this cookbook. The recipe is great. Thanks for the chance to enter. Sugar! My favorite! Pick me! Wow! It seems they thought of everything. I love the notes section. I would love a cookbook, I like to scribble all over my cookbooks, making comments etc. Oh, I love cook books. 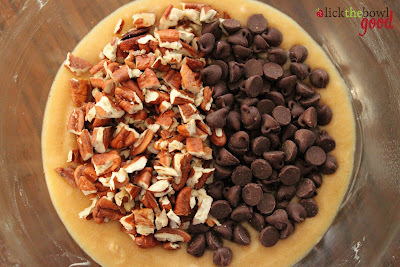 This looks yummy, I can see hours whipping up things with my kiddos. We all talk about how we've tried to make her recipes, step by step with the exact same brands, etc and they never, ever taste as good. Childhood recipe memory: My mother has an old gold cookbook stuffed with every kind of paper among it's glossy pages. My favorite is 'Peanut butter Fudge Cake' it was a sheet cake that did not look like much till you cut into it and could see the 2 layer frosting. SO SO SO Rich. I made it for my high school friends and it was a blue ribbon hit. For my recipe story... my Dad was stationed in Italy during the Vietnam war (he really lucked out,) and he developed an interest in cooking while he was over there. His signature spaghetti sauce is really good, although I understand it isn't very authentic: he uses quite a bit of honey to cut the acidity of the tomatoes, and I've heard that real Italian tomato sauce hardly uses any sweetener. But we love it, and I think of him and his travels every time I make it. THis is such a unique cookbook. Thanks for the opportunity to win it. A family tradition is a Butternut bundt cake using a special butternut flavoring. For any major holiday, it is expected that I make this cake. One Christmas, I decided to make something else, and I will never live down the protests to breaking of tradition! This cookbook sounds like a lot of fun and I always enjoy more recipes that contain sugar! My simplest chocolate cake recipe is one that was often called "Daddy's favorite chocolate cake" growing up. It was from our neighbors who took my young parents with two very young children under their wing when we first moved to the country. My parents were building a house and working in town and would come to pick up their two little blond girls after long days. Sweet Miss Connie would hand over the two of us and almost always have a piece of some type of cake or pie to give them to take home as well. This cake was a favorite! And even though it was only a 1/4 mile to get home the desserts almost never made it that far! One of my favorite recipes the so simple - it is for brownie icing. After pulling the brownies out of the over, melt 1 stick of butter on the stove. After it is melted, turn off the heat. Mix in 4 Tbsp cocoa, 6 Tbsp Milk, and 1 tsp vanilla. Then, slowly stir in 1 box (1 lb.) powdered sugar. Pour it over the warm brownies and let it set, for up to 2 hours. Delicious! remade my brownies and secretly hidden them away all for me! P.S. the recipe I use is on the inside of the Baker's Chocolate box. I am a genelogist and travel often to other cities tracing family history. I love staying in bed and breakfast inns while doing research. One such was run by a wonderful lady in Rusk County Texas. For breakfast the first morning she served us the best orange French toast that I have ever eaten. I asked if she would share the recipe and she was kind enought to make a copy for me. I have served it many times to many people and everyone I serve it to wants the recipe also. My grandkids think that is what is supposed to be served for Christmas breakfast because they have grown up eating it each year. my favorite recipe is from my Grandma. My grandfather was in the military, so when she was home with the kids she baked a lot. The best recipe though was the Blueberry Buckle, a blueberry coffee cake. Its so delicious and whenever I make it my dad gets flashbacks of his childhood. I have a crazy addiction for cookbooks! My shelf needs this cookbook on it, next to the others. Also, can't wait to try these bars for the holiday! Absolutely beautiful. You have done a great job all year! Merry Christmas and Happy New Year. quick story - for my 16th birthday, my mom gave me the betty crocker cookbook. The one with the red and white checked cover. And I HATED it. But, now, a few years later, it has followed me around and is still with me, and used regularly. Can you say that about any other birthday gifts you received? This cookbook looks awesome! How can you lose when you have the word sugar, not only once, but twice in the title! It's got to be good! My favorite recipe EVER is Peach Cobbler. My Grandma, Aileen (we called her Nanny)from Beaumont, Texas made it her whole life. Her mother died when she was 8 years old, leaving her father with her and her 6 year old brother. She took on the cooking duties at 8 and began making all sorts of things, but her dad loved this cobbler so it became her signature dessert. I grew up not knowing that this was something other people made as well. When I first tasted peach cobbler from someone else, I didn't think it could be the same thing because hers was just the best. She rolled out the crust and cut it into strips and put it on the top as a lattice. We were always asking her to write down the recipe, but of course she never measured anything, so one day my sister sat with her while she made it, pulling out and measuring every ingredient. Nanny has since passed away, and we have her famous peach cobbler 'recipe' now, but something always seems to be missing. I think it is her! The bars look perfect (as everything always does) - Sugar, Sugar sounds like a cookbook I would read from cover to cover. My favorite recipe is the one I tried last (if successful). LOL! My children laugh because I rarely make the same thing twice - especially with desserts. I am always looking for a new thing to try, so your blog and other food blogs have become my favorite past-time. I love it when mine turn out just exactly like the photos of the one I am trying. Thank you for all the inspiration! Oh I would love to win a copy of this. Those bars look wonderful, and thanks for providing a review of the cookbook! Love this new recipe for the Kentucky Pie Bars. Sound like these would add to my pastries for Christmas. Thanks for sharing. I LOVE new cookbooks and would really like to win this one! 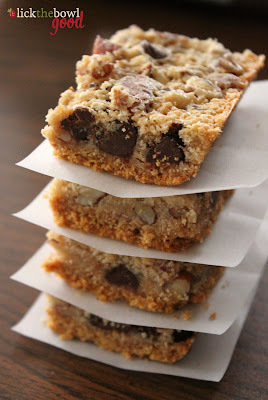 I am making these bars tonight! Wonderful recipe and hopefully everyone will love them at the luncheon tomorrow. Merry Christmas and thanks for sharing! I hope I could have that cookbook too. I love the Kentucky Derby Pie Bars I think it is delicious while drinking coffee. Monica, I sent you an email just now to the one you provided on the blog comment you left me. Thank you for contacting me. I have made Derby Pie for years-- (I pirated the recipe after eating it at a restaurant seven times------I figured it out), and it never even occurred to me to make pie bars-------so much handier (no pun intended). AND NOW you can find the recipe everywhere!! Sometimes good ideas just slap you upside the head--thanks!!! I am a dessert person and would love to add this book and make some amazing goodies. My daughter is studying to be a pastry chef and I am sure she would love to see what is in the book.